Her 1st Airbnb Spot. Fire pit, plot of land, and a beautiful deck overlooking open space trails. As most of you know, Colorado Springs is an area I’m looking into for a future investment, so I knew I had to call her to hear all about how her Airbnbs were renting. Not only was she generous with her information, she also told me an inspiring story that I just had to share with you all on how she got started! Without further ado, let me welcome Airbnb Superhost Shelly! I am excited to see what we can learn from her experience. ZM: Shelly, thank you so much for being open to sharing your journey with my readers. Can you tell me how you first heard about Airbnb and what made you know you wanted to try it? SY: Thank you Zeona, I can’t tell you how fun it was to get that call from you! I am obsessed with airbnb and to get a random call from my airbnb mentor was really cool. I heard about airbnb and thought only about it for traveling initially. It wasn’t for a couple years that I would revisit it, thinking like a real estate investor/host. I caught the real estate bug in Southern California where we owned our first home and watched it appreciate. So as we were wanting to move from our first home in Colorado Springs, I knew I wanted to keep that property if I could and rent it out. I started researching our options. I went back and forth for a couple weeks... Should we risk the uncertainty of a short term rental for the higher potential earnings or settle for lesser earnings and have the security of a set rent every month? It was a hard choice at first. Ok, are you ready for this?? Your podcast on BiggerPockets was the first time I believed short term rental could actually work. I made the decision that day. I chose it over long term rentals for two reasons. First, I loved the idea of diversifying my tenants. If I had a bad tenant they would be gone in a week. I wouldn’t be stuck with them for a year. And second, the potential income was so much greater. We had the potential to make double what we could make with a long term rental. So, thank you for sharing your story, because it influenced ours. ZM: Lately, I have been talking to people a lot about how some people can get stuck over-analyzing and feel like they never have enough information to get started. What were some hurdles you had to overcome to jump in? SY: I think the main hurdle I had to overcome was fear of uncertainty. Three years prior, we moved from Southern California to Colorado Springs, leaving everyone we loved to chase an adventure that we believed would be more in line with our values. That was the scariest thing I had ever done. It felt like I was risking everything and everything was uncertain. I bought some artwork to remind me of how important that one step of courage was. It reads: “Everything in life that matters requires RISK.” It was a huge paradigm shift for me and I know it is what allowed me to step out in courage and go for it with airbnb. The second hurdle to overcome for me, was that this didn’t look like my original dream. My dream was to own and run a retreat center. The funny thing is, it’s really similar and I believe is preparing me for that dream. So I guess I would encourage, do your research, ask yourself if you believe in it, and then move on it! You just have to make a choice, & continue to take steps towards it everyday. All that choice needs is your belief. ZM: How did you get the idea of renting out your backyard? How long did it take from idea to actually listing the space? SY: Once we decided to turn our house into an airbnb property, I started preparing & renovating immediately. We lived on a tight budget so that we could come up with the cash every month to do repairs, remodeling, and some landscaping. I did most of it on my own and somehow convinced family & friends who visited to help. As I was researching the airbnb listings in our area, I saw a listing for $25/night. A guy had listed his back yard for camping. My chin dropped. Can you do that? His yard was horrible. The photos were even worse, and he had 5 positive reviews!! What? I immediately thought, If he can do this, I can do this! So I did. In June I had the idea, I listed it July 2nd and July 3rd we had our first guest. We had a yard and a view and the kind of “grass” that was mowed weeds. So it wasn’t perfect, but it was what we had. The reason I decided to list it for camping was simply to learn the airbnb systems before I actually needed airbnb revenue. And I was happy to have any extra cash to throw towards house renovations. At the time, I had no idea that campers would end up giving us Superhost status and all the benefits that came with that title when we opened up the listing to include our entire house. ZM: What did you have to do to prepare? What was the initial investment? I love this idea because it feels like a low risk investment that is accessible to most people. SY: It really was a low risk investment. It took a little thought...what do campers need? Space to hang out, a tent, a fire pit and a bathroom. My son built a bench from cinder blocks and 4x4’s. 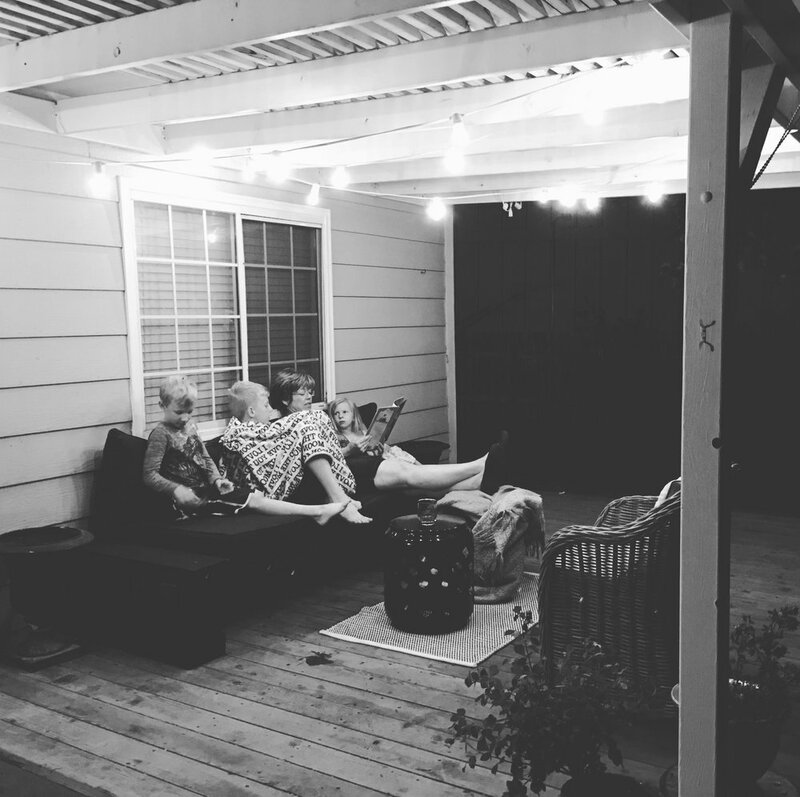 I bought cushions, a few plants, put together a smores basket for our guests, grabbed together our camping gear, and our ez-up & that was really all the backyard needed. It ended up costing me $350. ZM: I know a few people who rent RVs or airstreams on their property or in their driveway, and yet the issue is always the bathroom. How did you navigate this? Also, did you let them use your kitchen? SY: As far as the bathroom goes, we really had a perfect layout for that solution. Guests did not have to walk through the house and we didn’t give them a key. It was really two very separate spaces. The guests entered the backyard through the gate on the side of the house. Right next to that gate was a door that went into the garage. I hung a sign on the door that said, “This way to the bathroom”. Our guests would walk through our garage and directly into the bathroom/laundry room. We gave them access to a private restroom and private laundry room during their stay. The only catch was that our laundry room connected to our family room, and that didn’t provide for privacy. The doorway in between the rooms had hinges, so I went in search of the door and found it in the utility room in the basement. I installed the door (free!) and a lock and it was done. Bathroom solution solved. No one asked to use the kitchen. We did have some guests ask to use the shower and I was happy to oblige. They were usually in and out quickly and so thankful. I didn’t include that in the listing so that I had the freedom to offer it or not. ZM: How did you handle check-ins? I use a more automated approach but this seems a little different. Did you have to coordinate to meet each guest? SY: Yes, this was a little different. If we were there when they arrived, we would greet them and show them around a bit. If we weren’t, they made themselves at home in the backyard. If they needed anything during their stay, they were free to message me through the airbnb app or knock on the front door. Even though they were in our backyard, they could really choose the level of interaction. ZM: What was the set up like? What did you provide (tent, sleeping bags, air mattress, twinkle lights)? SY: The set up was simple. We had a bench with cushions on the back deck, a few little tables, and twinkle lights. A hose for potable water, the fire pit, and a basket with extension cords for charging. We did provide camping gear that we left in the garage for them to access easily. We had tents, sleeping pads, sleeping bags, an ez-up, and a couple chairs. Some used our gear and some did not. ZM: Everybody loves the numbers, would you be opening to sharing avg. nightly rate, security deposit, cleaning fee? Also what were the expenses vs. income monthly? SY: Of course, I’d love to share. I wasn’t sure how to price a backyard, so I called our local campgrounds to see what their fees were and I discovered they charged $40 a night and were completely full for the Summer. So I made our fee $45/night with no cleaning fee. Each stay cost me $7. I provided a bundle of wood and a smores kit. In the month of July, we had 60% occupancy and made $785 net profit. We received 7 good reviews all 5 star ratings and were awarded Superhost status by August. ZM: What offerings or options did you feel made a difference or helped you stand out to nab more bookings, charge more, get higher ratings, etc? SY: I feel like the location and back yard set-up really helped us. Also, allowing last minute check-in and of course responding right away always helps. The view really is spectacular and that’s what made it special. I think that transported them a bit and made it feel like camping. We have an open space area behind our house, that has trails just steps behind our fence. The fire pit also provided warmth and a place to cook. ZM: Do you have any weird or wacky stories to share with us from experiences working with guests? SY: Umm... one guest saw a bear in the open space behind our yard. I think it was a little startling but he was a pretty seasoned camper and handled it really well. I thought that was pretty ironic he saw a bear while camping in the middle of suburbia. We had never seen a bear in the 3 years we lived there. That was crazy. The second story taught me how to have better boundaries moving forward. Lol. But we had a couple break up in our backyard and we ended up babysitting their ferret for a couple hours. That was one of my kids favorite nights. :) Most of our guests were passing through on a cross-country road trip, or camping their way across the state, we had some that needed a place to stay before hiking Pikes Peak the next morning. Most people were super thankful to have a cheap, safe place to camp because campgrounds were full. We loved that Summer & even made some friends. ZM: How would you say your Airbnb experience differs from what you expected it to be like? What are you favorite parts and least favorite parts? SY: I honestly think its better than I expected. I currently host my listing, “The Gathering House”, and Co-host two more listings in Colorado Springs. I wasn't sure what to expect in the off season months of January and February, but my listing grossed $2400 in January and $3100 in February. If I had it listed as a long term rental I would have grossed $2000/month. I also made 20% from my co host listings those months. Co hosting has been a fun surprise. I see it as I get to own 20% of that property without any upfront investment. And I can implement the systems I create for my listing, for their listing as well. As far as favorite and least favorite parts of my Airbnb experience, I really enjoy anticipating guests needs, and encouraging them towards activities, great restaurants and hidden gems in the city, that I know they will love. Sometimes, I can’t believe how lucky I am to do this...I feel like I get to be a tour guide in a city I love!!! On the flip side the hardest part for me is when a guest is unhappy with something. But I’ve found that guests problems are really easy to fix if you show up, show them you care, & try to make it right. I had a couple that just seemed to have problems from the moment they got there and in the end they left a really nice and honest review because I showed them we cared. ZM: Where do you see yourself going from here with your Airbnb business? Do you have any words of advice or encouragement for people interested in getting started? SY: My husband and I plan to continue buying rental properties and turning them into airbnb short term rentals. Our family has also wanted to join in on investing and so we are all currently looking for our next property. I think I’d like to get creative with this next one and try to set our listing apart in anyway I can. Honestly, I think everyone should use airbnb. It is such a fun ride. No matter what you have, you have something to share that others are looking for. It may even just be time & knowledge of your city for co hosting or airbnb experiences . Look at what you have with fresh eyes. See if there is a space you have or talent you have that someone would be so thankful you provided. I just love this new sharing industry and I am so happy that our culture is learning to share. Sometimes we're just better together. ZM: Thank you again for sharing your wonderful story. If readers would like to stay with you on a future trip to Colorado Springs how can they find you? Have any of you guys rented a glamping spot on your property or do you have other creative Airbnbs? I want to hear about it! Share your stories in the comments.